﻿﻿﻿Proper outfitting will ensure archery success for kids. ﻿﻿﻿﻿﻿﻿﻿﻿﻿Archery is a fast-growing sport that’s enjoyable for all ages and abilities. For a youngster, a good start in archery will open the door to a lifetime of enjoyment. The trick is to pick out the right gear. Before you head to the archery shop, decide whether you are aiming for target shooting, hunting or even bow fishing. Types of bows range from traditional longbows and crossbows to the more modern compound bows and recurves. A bow needs to be “fitted” by draw length and the weight of the bow. Draw length is how far you pull the bow back before releasing the arrow. Weight is how much power it takes to pull the string back, measured in pounds. A child might need a draw weight of 10 or 15 pounds. Don’t buy a bow with the idea that a child will grow into it. Struggling to draw a bow that is too strong is dangerous. The child can hurt tender muscles and is likely to release the arrow early, causing it to fly off in an unsafe direction. Consult an archery shop expert to select and fit a bow. If you are considering buying a used bow, plan on having it inspected by an archery shop technician to ensure it is in good working condition. A bow can be “old” and still perfectly fine to shoot as long as it has been well maintained. A bow that has been mishandled, poorly maintained or dry fired (drawing and shooting without an arrow) may have unseen damage and can be unsafe. Arrows come in aluminum, carbon, fiberglass, wood and “hybrid,” made from a mixture of aluminum and carbon. The material used affects flight, speed and strength, also called “spine.” Archers have preferences, but be sure to choose an arrow that is strong enough for the bow. A weak arrow could break or simply not fly straight. Another concern is splintering, which can damage a wood, fiberglass or carbon arrow that strikes a hard object. A damaged arrow may break upon release. Schools and youth programs use aluminum arrows because they have a good spine and will not splinter. Always inspect the shaft, nock, point and fletching for damage each time an arrow is shot. For the bow and arrow to work well together, the arrow needs to be the correct length. The arrow should be long enough to not come off the arrow rest when drawn back completely and yet not extend too long past the rest. Use a chart or ask an archery shop technician to help you match the arrow to the bow you use. There are arrow size charts on most manufacturer websites to help you. Beginners should wear an arm guard to protect their bow arm from being thwacked by the bowstring as they learn how to position themselves and the bow when shooting. A bow glove or finger tab will protect fingers, and is worn by most archers. There are many optional accessories including quivers, arrow rests, sights, silencers, vibration dampeners, stabilizers and targets, to name a few. Advice and experience will help you decide on which accessories are right for you. The Archery Trade Association website, www.archerysearch.com, will help you locate local archery shops. The shops often have indoor ranges and lesson opportunities for beginners. Find a local archery program to learn in a safe environment and be taught proper shooting techniques. Ask your city parks and recreation department if it offers archery. Check with your county AgriLife Extension office to see if there is a 4-H Shooting Sports archery club near you. 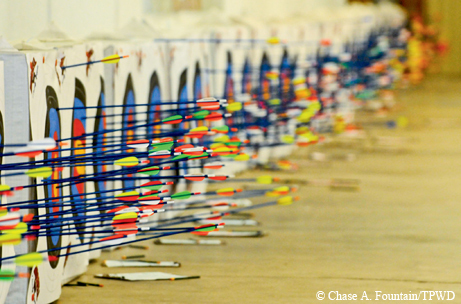 Junior Olympic Archery Development programs are also a great place to get started. The Texas State Archery Asso­ciation, www.texasarchery.org, has links to all sorts of resources. Lastly, you may be lucky enough to have the National Archery in the Schools Program at your school. To find out more about it, visit the Texas Parks and Wildlife Department website, www.tpwd.state.tx.us. Always check your archery equipment for damage before using it. Draw a bow only if it is nocked with an arrow. 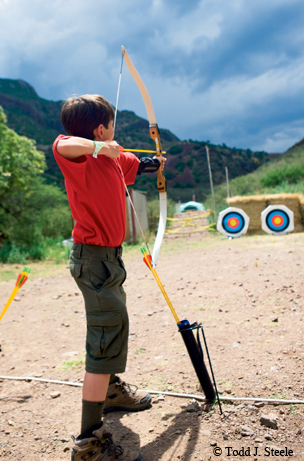 Practice archery at a designated range or place specifically set up for shooting activities. Always make sure that an arrow’s path is clear of people, animals and obstructions before drawing and shooting. Always know what is beyond your target as well as the maximum distance your arrow can travel. Point only at the intended target. Designate a shooting line when more than one person is shooting. Avoid horseplay and follow good safety habits while enjoying the sport.